Property Size 3,400 sq. ft. POOL SEASON: Memorial Day Weekend through Labor Day Weekend (3 night minimum for this time frame). 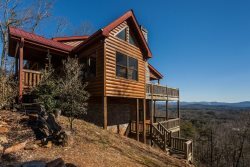 Mountain Lake Lodge is privately situated 14 miles from downtown Ellijay in an upscale gated development called Lakeland Estates. This home is unique in that is not only has a private lake in the back yard but a 6' private pool also! A beautiful 40ft. screened in porch across the back of the home overlooking the lake and the pool provides the perfect place to kick back and enjoy the views as well as watch for some of the wildlife that call this area home. The lake which is about an acre in size can be enjoyed from the paddle boat or canoe that is on the property or from the banks with a fishing pole and your favorite bait. Catfish and native Bream offer the the experienced or inexperienced fisherman plenty of chances for sharing some great "fish tales" with friends and family. Inside, you'll find all the comforts of home including a wood burning fireplace and a 42" flat screen TV in the great room. The fully equipped kitchen is spacious and has everything needed to prepare some great meals. The Queen Master is on the main level with its own private bath including a garden tub and walk-in shower. Upstairs is a spacious loft with a futon and beautiful, comfortable furniture providing a place for relaxing as well as extra sleeping. There are also 2 more Queen bedrooms on this level with a full jack-n-jill bathroom. Continue on up the stairs to the "Tower", a great place to sneak away with a good book, enjoy the views. The terrace level houses a billiard table, air hockey, flat screen tv with seating, a wet bar and a mini frig. The 4th bedroom with a standard and twin size bunk, as well as another full bath with tub/shower combo is located on this level. With all this home has to offer, including being pet friendly, now is the time to reserve this cabin! *NIGHTLY RENTAL RATES ARE BASED ON 10 PEOPLE. THERE IS A FEE OF $15 PER PERSON PER NIGHT FOR EACH PERSON OVER 10 UP TO THE MAXIMUM QUANTITY. Fully equipped kitchen: Refrigerator, stove, oven, microwave, dishwasher, toaster, coffee maker, dishes, glassware, utensils, cutlery, pots, and pans. Linens for each bed, 2-bath towels, 1-hand towel, 1-wash cloth per person listed on guest list, dresser or closet for clothing storage, central heat & air, washer/dryer, vacuum and/or broom and dust pan, mop, cable or satellite TV, internet, telephone for local calls and propane grill. In addition we provide a complimentary start-up supplies of: Toilet Tissue (2 rolls per bathroom), 1- roll paper towels, 4- kitchen garbage bags, 1- hand soap for each bath and kitchen, dishwasher detergent, dishwashing liquid and laundry detergent for at least 2 loads. From the very first phone call the staff at Mountain Oasis were incredibly helpful. I had to call back a few times after booking and they walked me right through any issues I was having. Very friendly as well! We were so comfortable in this cabin! It was chilly outside and very warm and welcoming inside. The cabin and the view were both breathtaking! Can not wait for our next stay! Your beautiful home accommodated our large party's needs. We loved the loft so much. The peaceful starry nights, hot tub, hikes to the lake, spacious kitchen and well appointed so that we had all we needed to grill and cook two nights in a row! We did have wifi issues first night and a technician had to come out and install a new router, but we were tickled that they actually did this on a Friday night after our troubleshooting efforts. Heat worked well, fire place was lovely. So spacious and lovely views from every window. Easiest check in and check out EVER! Thank you for sharing your home with my family and friends. It was very spacious, and slept everyone comfortably. The living area was huge which allowed everyone to relax all at once comfortably. The house was beautifully decorated, and completely spotless when we arrived. We loved that the hot tub was already heated when we arrived. The view from the tower room is breathtaking! The only downside to our trip was the wifi. When did not have wifi the entire trip, but everyone still had service so it wasn't that big of a deal. I would still give the property a 10/10 rating. The staff was very helpful in trying to help us fix the wifi, but I think the router was just toast. Would for sure come back again next year! You will regret not staying at the cabin! Especially if you have a larger group. The cabin was everything we could have ever wanted for our Christmas getaway. Our family of 10 had plenty of spaces to sleep in and the tower and the lake with the boats were a treat. We really enjoyed the pool table the most. The beds are incredibly comfortable. The cabin is extremely spacious, and just breathtaking. This was a girls family trip. We loved the cabin and property. Absolutely gorgeous! We plan on renting this property again next year. Staff was very courteous. Very good service, beautiful cabin. I really enjoyed this cabin and everything it had for the kids to do. The Maintenance guy was nice and very helpful, check in and check out was good, I would stay again in the future. Couldnt have asked for a better cabin to stay in to keep the kids entertained. Oh my! Thank you so much for having the perfect property for our first big family vacation! The Mountain Lake Lodge was beautiful and had everything we needed. The "wow" factor when we walked in the door just carried through every room. It was spacious, clean and inviting. The view from the tower was amazing. As for the weather, well since all but two of us are native Floridians, the little snow flurries were just icing on the cake for us. There is nothing we would have changed. The game room was the perfect "hang out" for those wanting to play pool or talk into the night without bothering the little ones while sleeping upstairs, the screened porch was a nice place to relax with hot chocolate and enjoy the view, the hot tub, the little lake and boats, the upstairs loft sitting area, kitchen large enough for us to move about with stepping over each other--well, we could go on and on. We look forward to doing it again in the future. We had such an incredible stay. It could not have been better!! We plan to make this an annual tradition, so we will see you next year!! Great cabin for a big group of people. We especially enjoyed the canoe and the pool table. We stayed there for 3 nights and never felt the need to leave and go anywhere because we were having fun hanging out around there. My 6 year old son asked if we could live there, so I guess that's a pretty good review. We had a great time, my grandchildren loved the whole experience, from the pool, hot tub, lake, to the cabin in general. We had good family time and that is something in itself, no one could ask for more. I again thank you for allowing us to use your home for a great vacation and family time. I loved absolutely everything, from the minute I parked to opening the door was breathtaking thank you so much. Enjoyed every second. Was exactly how I expected and a little more.. Thank you. Will definitely go again..